A REPORT predicting a decline in fortunes for Scottish seafood sectors after Britain leaves the EU has received a mixed reaction from industry sources. A study commissioned by the Scottish Government says that “remaining in the single market and the customs union is the least worst outcome for the sector”. And it warns that “all of the plausible trade scenarios modelled would leave Scotland worse off than the current situation as a member of the EU”. Rural Economy Secretary Fergus Ewing said the government would continue to push to remain in the European Single Market and a customs union with the EU. “We will also reiterate our calls for the UK Government to guarantee that it will not bargain away access to Scottish waters and resources to secure other UK interests,” he added. 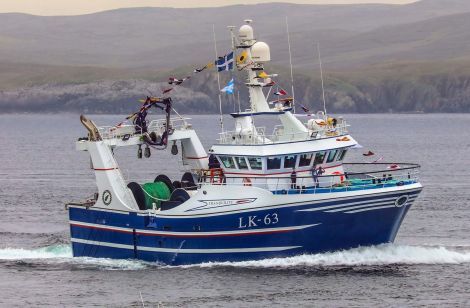 Hansen Black of fish traders Shetland Fish Ltd said that the firm was currently exporting cod to France and would not like to see any hurdles put in the way of that business. But he added that it was impossible to predict what would happen post-Brexit and that any models tended to be proved wrong in due course, while the findings of studies invariably favoured the viewpoint of those who had commissioned them. Black added: “In reality we do not know what impact it would have on the industry. Loss of European trade might be outweighed by the gains from increased quotas and fishing opportunities in UK waters, he added. The report discounts this, saying that “any increase in fishing quotas would be offset by increasing tariff and non-tariff measures once the UK leaves the European single market and customs union”. It also makes a gloomy forecast for farmed salmon – the UK’s most valuable food export – export value of which could decrease by four to six per cent in the absence of free trade with the EU. “Under all of the scenarios Scotland’s aquaculture industry would be negatively impacted”, it adds. The plausible scenarios examined in the report include three where the UK ends free trade with the EU, and some level of tariffs and non-tariff measures apply on products exported to the EU. They exclude the scenario with free trade with all countries of the world. Scottish Fishermen’s Federation chief executive Bertie Armstrong said the report underlined the importance of the UK regaining sovereignty over its own waters and becoming an independent coastal state with the powers to control access and fishing opportunity. That could be worth an additional £540 million in income to Scotland and create 5,000 more jobs, he claimed. Armstrong added: “Any other course of action would be harmful to the fishing industry and, given its importance to coastal communities – again as highlighted in the report – that would be totally unacceptable.